Base ten blocks are an excellent tool for teaching students the concept of addition or subtraction because they allow children to touch and manipulate something real while learning important skills in mathematics. 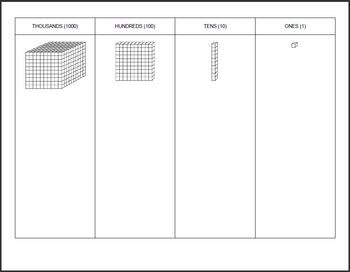 Base ten blocks consist of cubes, flats, rods, and blocks. 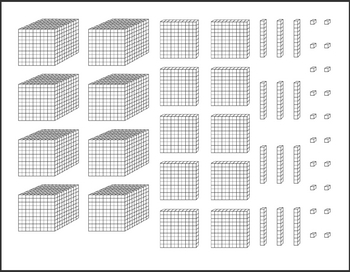 Cubes represent a 1000 units, flats 100 units, rods 10 units, and blocks a single unit or 1. Base ten blocks are a great instructional tool whether you are introducing the concept of addition, subtraction, regrouping, or place value. Aside from using the actual base ten block manipulative (plastic), stickers, stamps, and paper printables have been used to represent base ten blocks in mathematics. 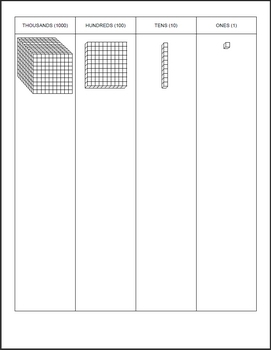 Along with real base ten blocks or in the absence of, these printables and work mats may be used during instruction, activities, or for center use. Page 1: Base ten block work mat with example of cube, flat, rod, and block unit (landscape/horizontal). 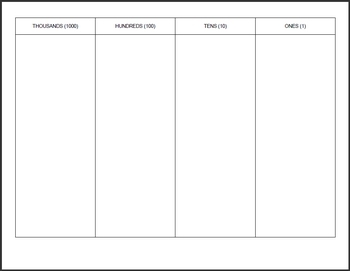 Page 2: Base ten block work mat with no examples (landscape/horizontal). Page 7: Cubes, flats, rods, and blocks clipart. Page 8: Base ten block work mat with example of cube, flat, rod, and block units (portrait/vertical). Page 9: Base ten block work mat with no examples (portrait/vertical). Page 10: Cubes, flats, rods, and blocks clipart.